The long-held notion that people can only get shingles once in their lives appears to be false, The Wall Street Journal reported Tuesday, citing a study in the journal Mayo Clinic Proceedings. It is estimated that one in three Americans will get shingles at some point, with one million new cases reported a year in the U.S. It typically starts with itching, tingling or numbness, then develops into a painful rash that blisters. The CDC has urged all Americans age 60 and older to get the shingles vaccine -- whether they have had shingles or not. Merck & Co., the only company that makes it, has encountered frequent supply problems since the vaccine was approved in 2006. 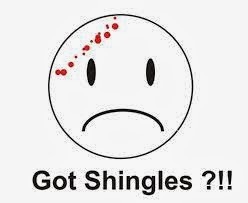 Shingles is caused by the Varicella zoster virus, or VZV, the same virus that causes chicken pox, and it only strikes people who have had chicken pox in the past. Like other herpes viruses, VZV never fully leaves peoples' bodies. It can lie dormant for decades in the nerve roots in the spinal column, until it suddenly replicates and travels down the nerves to cause shingles. Exactly what prompts the virus to wake up is unknown, but it seems to occur when the immune system, which has kept it in check for years, becomes weakened due to age, illness or treatments such as chemotherapy. Emotional stress can cause recurrences of other herpes viruses, and the CDC is investigating whether it can spark shingles as well. For the new study on shingles recurrence, researchers at the Olmsted Medical Center in Rochester, Minn., examined medical records of nearly 1,700 patients who had a documented case of shingles between 1996 and 2001. They found that more than five percent of them were treated for a second episode within an average of eight years -- about the same rate as would typically experience a first case. That a recurrence is so common is more of a surprise to virologists and other scientists than primary-care physicians, who have seen it in their practices, says Barbara Yawn, director of research at the Olmsted center and the study's lead author. "I've gotten calls and e-mails from some saying, 'Thank you. Now they will believe us.'" It is possible that some subgroups of the virus are more prone to recurrence, says Yawn. In their next study, her team is monitoring new episodes of shingles and the CDC will analyze samples of those that recur to look for genetic patterns.